Vulcanic flange heaters are designed for the heating of fluids (water, oil, heavy fuel, glycol, acids, caustic soda, asphalt, etc.) or gases (air, nitrogen, CO2) by natural or forced convection up to 75 kW, 750 V 3-ph, 400 °C, 50 bar. 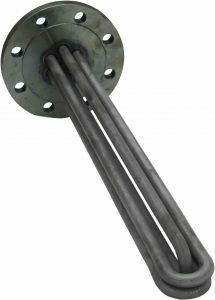 Vulcanic heaters comprise a very compact bundle of pin heating elements available in various materials compatible with the fluids to be heated (steel, stainless steel, Incoloy®, etc.). The heating elements are welded onto a flange conforming to standard EN 1092-1 or ASME B16.5, with dimensions from DN 32 (1”1/4) to DN 100 (4”). 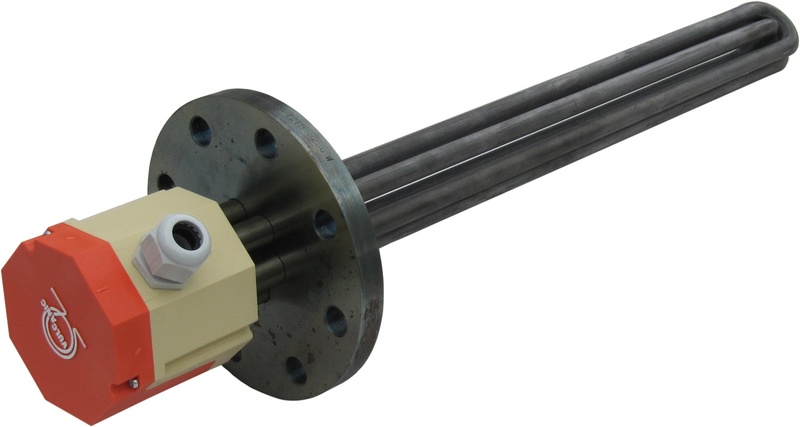 Flange heaters can be equipped with control and safety devices (thermostats, PT100 sensor, thermocouple, etc.) for the measurement of the temperature in the fluid or of the heating elements. An electrical control and power supply unit with IP44 to IP 66 protection rating, in polyamide, aluminium or painted or stainless steel, protects the connections from the heating elements to the power supply and from the control and safety devices to the power cabinet. Vulcanic flange heaters are designed and manufactured as part of our standard range or as a customised solution in our factory in St Florentin for installation on vessels conforming to European directive 2014/68/EU (PED).